8 Dog Cancer Treatment Options | Which is the Best for Your Dog? 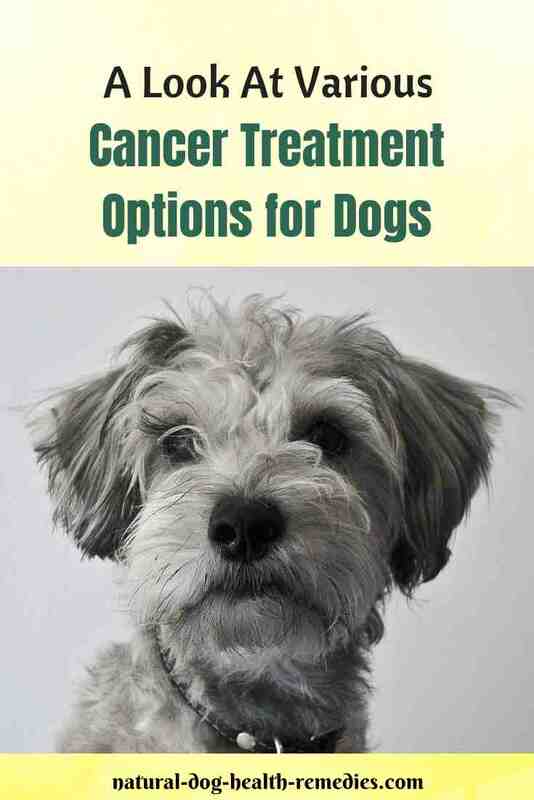 Coping with the fact that your dog has cancer is of course not easy, what is perhaps even more difficult is deciding on the cancer treatment option(s) for the dog. 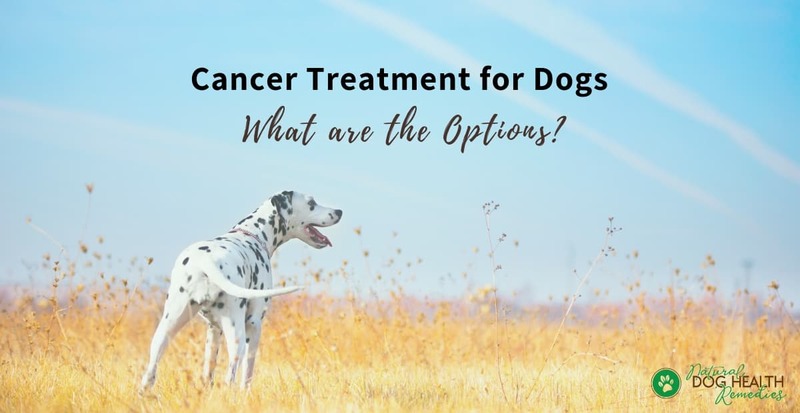 When deciding on the best treatment option for YOUR dog, it is important to understand that each dog is different and there is no one cancer treatment program that is perfect for all dogs. Even dogs with the same type of cancer may receive different treatment programs. Which Treatment Option is the Best for Your Dog? Which treatment provides the highest chance for cure? 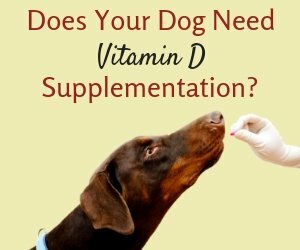 Which treatment ensures the dog's quality of life? Very often, the best therapy is not a single type of conventional treatment, but a combination of various conventional and natural therapies. Since diagnosis in many canine cancer cases is late, the more types of therapies used, the better chance there is to fight and beat the cancer. Even if the prognosis is poor, you may still be able to use certain cancer treatment to make your dog more comfortable so that he can enjoy a better quality of life longer. The three conventional cancer treatment options are surgery, radiation, and chemotherapy. Depending on the type, size, and location of the tumor in question, surgery can sometimes be curative. However, in cases where diagnosis is too late, or the tumor is too big or is in a location where total removal is impossible, surgery by itself may not be curative. Other treatment such as chemotherapy and/or radiation may be needed. There are also occasions when surgery is used not to cure the dog patient, but to improve the dog's quality of life by relieving pain and discomfort. These days, with modern anesthetics and medical equipment, surgery is rather safe and complications are rare. Having said that, no surgery is completely safe, and sometimes after-surgery complications can occur. The most common ones are bleeding, infection at the surgical wound, and seepage from the wound. As well, depending on the site of the surgery, sometimes the dog patient may lose certain body function. For example, eating difficulty after oral surgery, or incontinence after bladder or colon surgery, etc. Chemotherapy is the use of medications to stop the cancer cells from growing, reproducing, and spreading. These drugs are designed specifically to damage cancer cells as they grow and divide, and they work best on rapidly growing cancer cells. Most healthy normal cells do not grow and divide as quickly as cancer cells, with the exception of blood cells developing in the bone marrow, cells lining the hair follicles and lining the stomach and intestinal walls. Therefore, chemotherapy can affect these healthy growing cells to some extent but only temporarily. Chemotherapy can seldom cure a dog patient, but it can put many cancers into remissions. This allows the dog patient to live longer and enjoy a better quality of life. Many dog parents are wary of chemotherapy because of the various side effects caused by chemotherapy in people. In fact, since medication dosages used in treating dog patients are significantly lower than those used in treating people, dog patients seldom get the nasty side effects seen in people. Another cancer treatment option for dogs is radiation therapy, which utilizes high-energy ionizing radiation to kill cancer cells. Radiation is a local therapy because it is used to target and kill cancer cells in the area being treated. Radiation therapy works by breaking down one or both strands of the DNA molecule inside the cancer cells, thus preventing them from growing and dividing. While normal cells around the targeted cancer cells can be affected by radiation as well, they are better equipped for repairing damage to DNA than the cancer cells. Since cancer cells are rapid growing, they cannot repair the damage sufficiently before dividing and reproducing, therefore, radiation can kill the cancer cells more readily. Radiation therapy may be used after surgery to kill off the remaining cancer cells or before surgery to shrink tumors. In cases where the tumor is inoperable, radiation therapy can be given solely for palliative purposes to make a dog patient more comfortable by shrinking the tumor and slowing down its growth. The optimal dosage of radiation should be in the smallest amount possible to ensure the comfort of the dog patient. Usually radiation treatment is given from two to five times a week, for up to three to five weeks. Dog patients have to be sedated or under general anesthetic during treatment. 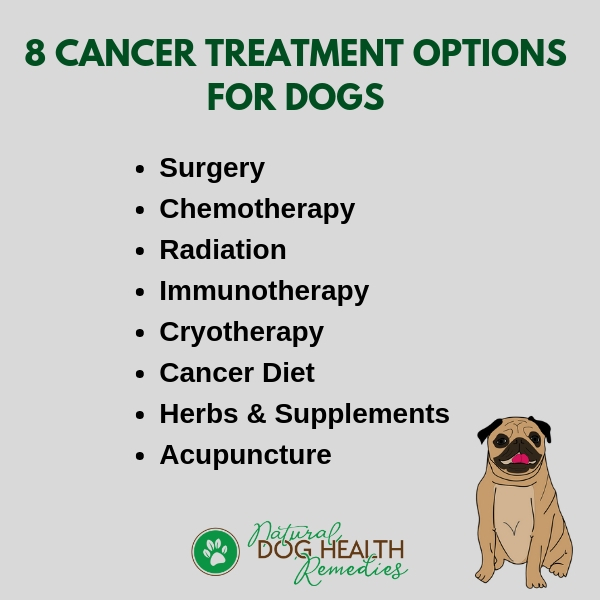 In addition to the above 3 treatment options, there are other complementary treatments that you and your vet may consider, depending on your dog's cancer type and stage. This therapy uses antibodies (given as an injection or orally) to enhance the natural defense mechanism of the dog patient's immune system. The idea is to use the dog's own immunity to fight and kill off the cancer cells. Unfortunately, it is almost impossible for the immune system to kill ALL cancer cells in the body. Therefore, this therapy is usually used in conjunction with other treatment options, such as surgery, radiation, or chemo. For small tumors that occur superficially (e.g. on the skin, oral cavity, etc. ), sometimes the cancer cells can be frozen and killed by using cold temperatures. Note that this treatment option is only doable if the cancer hasn't spread to other locations. While a cancer diet by itself cannot cure a dog with cancer, it may help boost the immune system and improve the quality of life of the dog. Some food items can also help fight off cancer cells or suppress their growth. See my article on Dog Cancer Diet for more information. Quite a few herbs and supplements can be used to complement conventional canine cancer treatment. Some dog parents have reported good results using some such herbs and supplements. Their dogs were able to have a higher survival rate, and the quality of life was also greatly enhanced. Be sure to check out this page for more information. Again, acupuncture may not be able to cure canine cancer, but it could be used as a complementary treatment to manage some symptoms, such as pain caused by the cancer. If you are considering this treatment option for your dog, ask your holistic vet, or access the website of International Veterinary Acupuncture Society to find a vet who may be able to help your dog.